In stock. Order in the next 1 hour, 25 minutes and it will go out today! 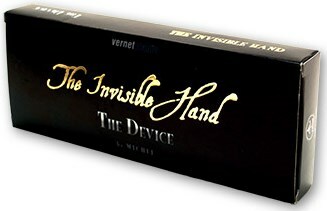 The Invisible Hand is the new name we give to an old device originally known as Hold Out. You can do wonders in your magic act with this device. You can vanish different objects, change colors, sizes or shapes, cut and restore a rope, etc. ; standing in front of the audience with your hands away from your body and away from the table. You can show your hands before and after the effect. You can do magic with balls, eggs, cards coins, silks, bills, watches, pens, etc. It is useful either in Close Up or Stage.